We’re offering classes for adults of all ages! 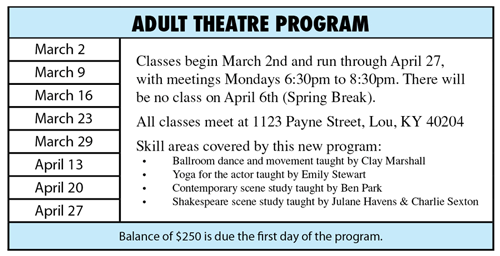 Classes begin March 2nd and run through April 27, with meetings Mondays 6:30 to 8:30 at Walden Theatre. There will be no class on April 6th (everyone gets a break during Spring Break! Cost is $250, and the registration form is available here. Questions? Call us and speak with Charlie Sexton. Spread the word, and help us get this class off to a great start!